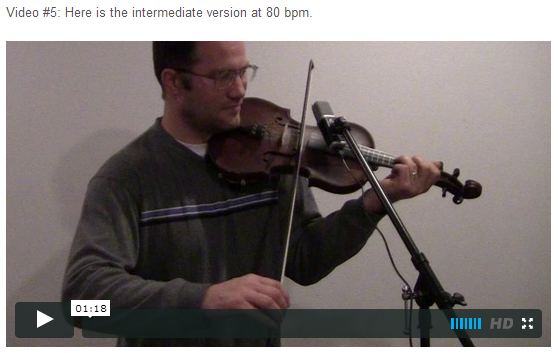 http://accountinator.com/2011/10/avoid-fixed-costs.html buy Keppra in canada This is an online fiddle lesson for the tune "Jingle Bells." 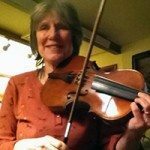 BluegrassDaddy.com is your best source for Bluegrass, Old Time, Celtic, Gospel, and Country fiddle lessons! 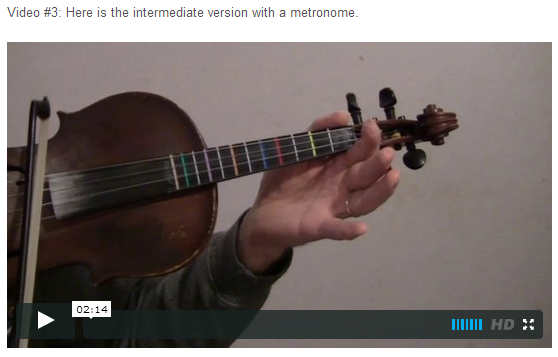 Video #1: Here is a video of me performing the fiddle tune "Jingle Bells." It is an unsettled question where and when James Lord Pierpont originally composed the song that would become known as "Jingle Bells". A plaque at 19 High Street in the center of Medford Square in Medford, Massachusetts commemorates the "birthplace" of "Jingle Bells", and claims that Pierpont wrote the song there in 1850, at what was then the Simpson Tavern. According to the Medford Historical Society, the song was inspired by the town's popular sleigh races during the 19th century. A sleighing song tonight. Oh! In a one-horse open sleigh - Hey! Christmas is coming the goose is getting fat, please put a penny in the old mans hat. If you haven’t got a penny, then halve a pence will do, if you haven’t got halve a pence then God Bless You! Hi John, thanks for the great music sheets and song selections. I noticed that the music sheet for intermediate version of Jingle Bells actually links me to Over the River and through the Woods. 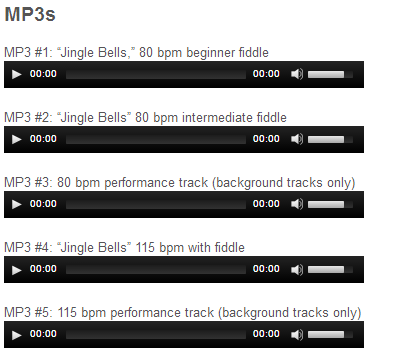 Is it possible to connect it to the Intermediate Version of Jingle Bells w/notation? thanks! 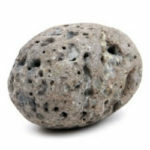 Hi John, I’m really enjoying your on line lessons. Just wondering if you could give some feedback on getting my speed up. I am really struggling to get any song with a “shuffle” in it up to speed. Are there any helpful exercises that address this. (I have been focusing on Jingle bells because the left hand isn’t that complicated-, but it has been two weeks and I just cant get my bow arm to move faster!) Is it all in my head? and I have to know it so well I don’t have to think about it. ? That is great advice from Angela. It really is amazing how much less bow I use when playing fast than when playing slow. It’s almost like it’s a totally different song. 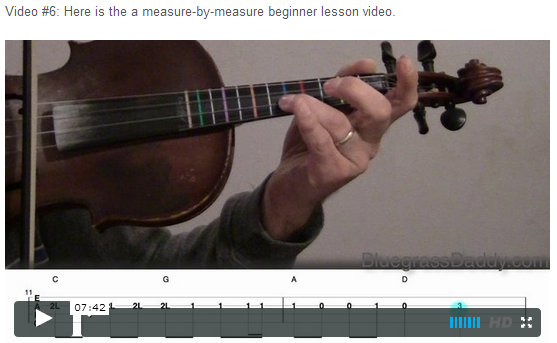 Practice the shuffle independently, by itself, on some open strings. Once you can shuffle fast without the left hand, you can start adding notes in. 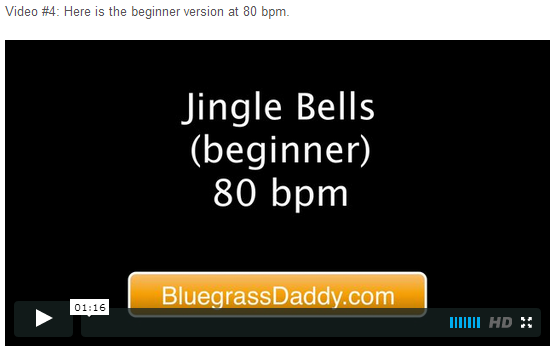 Jingle Bells is a good tune, but hard to get fast. 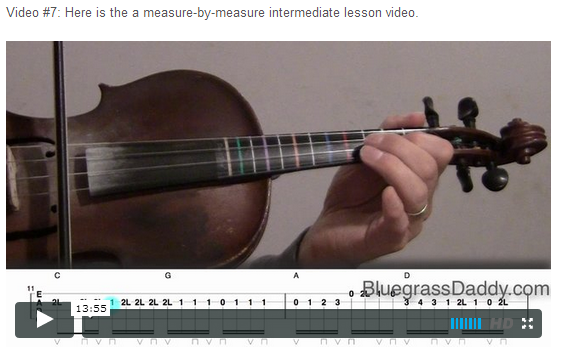 I recommend starting with Fire on the Mountain, or Old Joe Clark for practice with fast shuffles. I feel sorry for his bow hair! I’ve seen it before…he makes smoke come outta that thing on that tune. 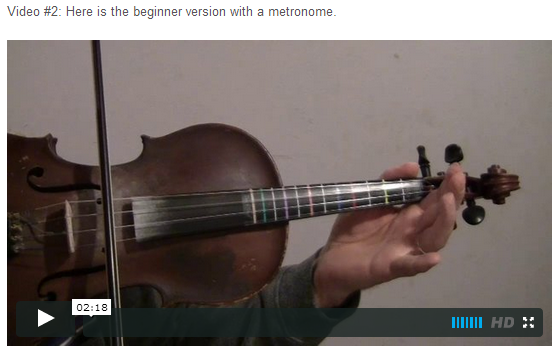 Gosh, John…I’m an admirer…you play any style like its nothing! That’s amazing! Thank you for the feedback on playing fast! I think I’ll give jingle bells a rest and really focus on the shuffel. I think that is a good idea! Once you are comfortable with the right hand making constant shuffles, it will be so much easier integrating the left hand and getting those notes up to speed. Thanks Angela! I am going to post more jam vids with my brothers and others. It is so much fu! My bros and I played three concerts this weekend, and in between we had a talk about integrating them into BGDU and making it a family venture.